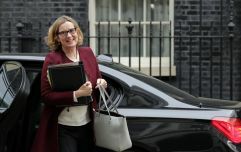 Work and pensions secretary Amber Rudd has admitted that the government's rollout of Universal Credit is to blame for an increase in the usage of foodbanks, after years of denial by successive ministers. The controversial new system was meant to simplify access to benefit entitlements for those who are on low incomes or out of work, however, it has been plagued by criticism and delays since its initiation in 2010. Stats from the Trussell Trust show that the number of emergency food packages given out by the charity between 2010-11 and last year increased from 61,000 to 1.3 million. Speaking in the Commons, Rudd said: "We are committed to a strong safety net where people need it. "It is absolutely clear that there were challenges with the initial rollout of universal credit –and the main issue that led to an increase in food bank use could have been the fact that people had difficulty accessing their money early enough. She added: "I have acknowledged that people having difficulty accessing the money on time as one of the causes of the growth in food banks, but we have tried to address that." Universal Credit had been due to be gradually rolled out across the UK and up and running by 2017, but it is now expected it will not be fully introduced until at least the end of 2023. Figures show that 31 per cent of electronic foodbank referrals over a period of six months last year were the result of a person's benefits being delayed.